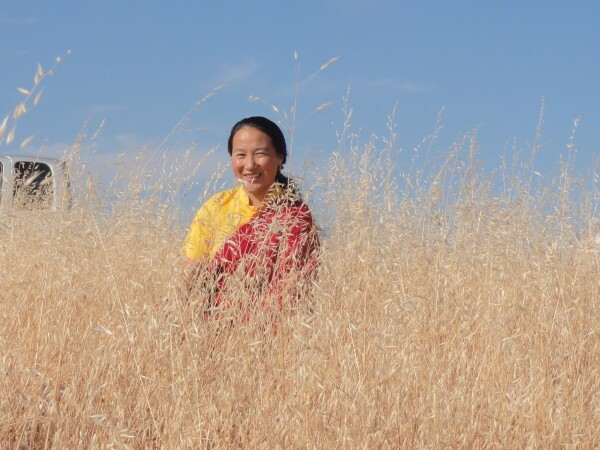 Khadro-la at Land of Calm Abiding, California, United States, June 2012. Photo by Ven. Holly Ansett. Mandala: There is concern about earthquakes on the West Coast of the United States. I understand that during this visit to the United States, you are looking for sites on which to build stupas to help with this. Can you tell us more about this? Khadro-la: I heard through Lama Zopa Rinpoche that some scientists were forecasting that there could be a huge earthquake and possible tsumanis on the West Coast of the United States sometime in the future. Rinpoche heard this somewhere – on the news or some people told him about this. Hearing about this prediction of tsunamis or earthquakes, Rinpoche was really concerned that there would be a lot of damage to people and property and started thinking about what would be the best way to be of benefit in such a situation. Rinpoche asked me what would be beneficial to do before this event took place. I mentioned to Rinpoche that the problems caused by nature and the various natural elements are hard to eliminate completely. At that same time, I had a kind of sense or vision of a particular landscape and different shapes of stupas. I felt if we could do something around that area, maybe it could be a little beneficial. I mentioned to Rinpoche that building some stupas along the West Coast might help. The forces of nature may still occur, but maybe there will be less destruction of lives and property. Or maybe it can postpone the occurrence of such events. While I was flying to the United States, before the airplane touched down in California, I fell asleep. Then all of the sudden, I woke up and looked through the airplane window and saw the area that I had had a vision of before when I was in India. Later on, we investigated that area and found that it is on government land, like in a park. One other area that I had a vision of seems like it is in Washington State. I haven’t found the exact location yet, but that’s where we are going next. To be clear, the building of the stupas will not stop the earthquakes and tsumanis. They are just to benefit sentient beings a little bit. It’s not to fight against the forces of nature or eliminate all those things. Rinpoche asked me to help. Since Rinpoche is always thinking about benefiting others at all times, it is all being done in this light. I had these kinds of visions or ideas and told them to Rinpoche, but this could be because of previous karma and dependent arising and so many other causes. I’m not anything special. Also, if such events are forecasted by scientists, it seems that the state and local governments have more responsibility to manage the response. But we are doing our own part. Rinpoche always tries to benefit and help all the people, and that’s why we’re doing this. You can directly support building this critically important stupa through FPMT’s Stupa to Minimize Harm from the Elements Fund. If you know the psychological nature of your own mind, depression is spontaneously dispelled; instead of being enemies and strangers, all living beings become your friends. The narrow mind rejects; wisdom accepts. Check your own mind to see whether or not this is true.